Slewing bearings can accommodate axial, radial and moment loads acting singly or in combination and in any direction. They are not mounted in a housing or on a shaft, but directly to a seating surface. The inner and outer rings are supplied with mounting holes. Both rings may have integral gears. They are also referred to as slewing rings and tabletop bearings. 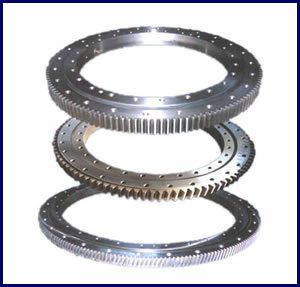 Slewing ring bearings can perform oscillating (slewing) as well as rotating movements. They may be used without gears or with internal or external gears. The slewing bearings are the large-size bearings which can carry higher axial, radial loads and over turning moments. The slewing bearings are usually porvided with mounting holes, internal gears or external gears, lubricant holes ans seal equipments. Crossed cylindrical roller slewing bearing is with the larger dynamic capacity.